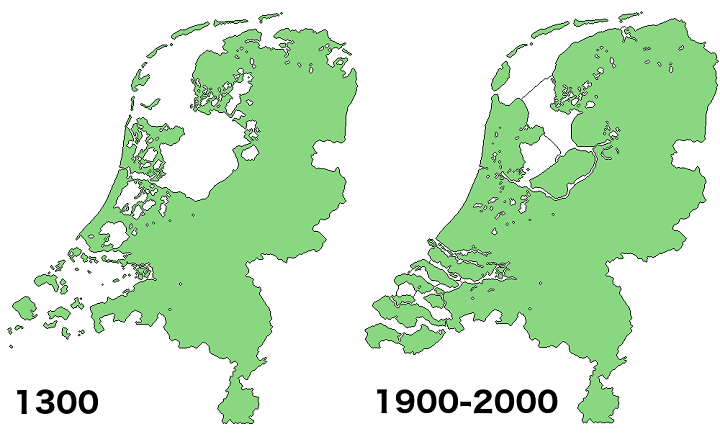 The map comparison above shows what the land area of what makes up the Netherlands today, looked like in 1300 compared to what it looked like in 2000. Around 17% of the country’s current land area has been reclaimed from the sea or lakes. 26% of its area is located below sea level. 21% of its population lives in areas below sea level. Only 50% of its area is more than 1 meter above sea level. Lowest point: Zuidplaspolder −7 m (−23 ft), below sea level. Highest point (In Europe): Vaalserberg 322.7 m (1,059 ft) above sea level. Flevoland is the most recent Dutch province and was only created in 1986 on land that was most reclaimed in the 1950s and 1960s. Just back from Holland this morning after two weeks holidays. Visited a couple of beautiful historic steam powered pump stations and drove over the IJsselmeer and the Delta Werks dykes. So we saw up close the works. Amazing engineering. The Haarlemmermeer also drew my attention. An area that is missing on the maps is the ´ Middelzee´ in Friesland. Only the northermost part of it is represented on the maps. I think the third and the fourth color should be switched. 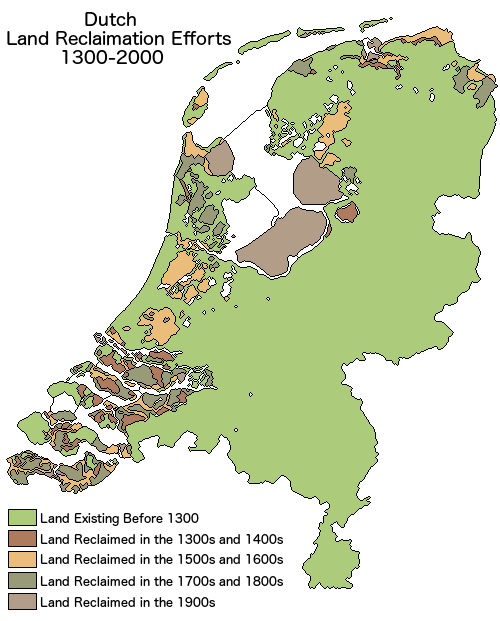 All the yellow areas have been reclaimed in the 1800s and 1900s, for example the Haarlemmermeerpolder in 1852 and the Zuidplaspolder in 1840. areas with the fourth color have all been reclaimed in the 1500s and 1600s, for example the Beemster, Schermer and Wijdewormer in 1612, 1635 and 1626 respectively.